A flooring installer’s dream has grown into one of central Maine’s largest holiday events. 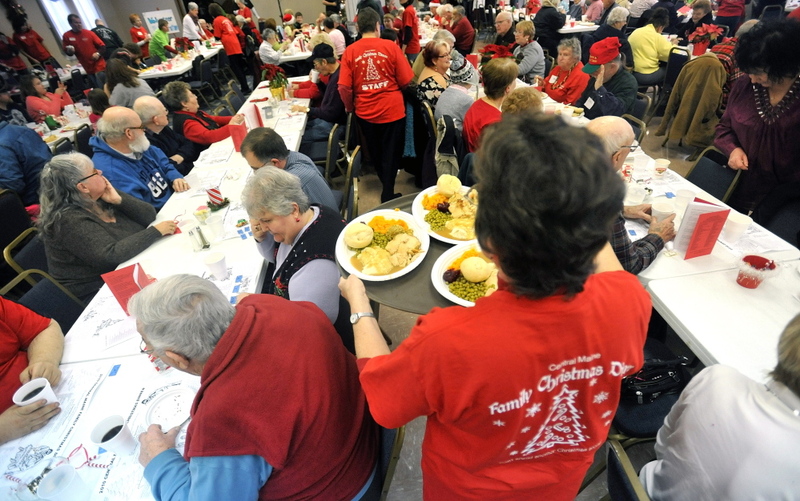 WATERVILLE — A flooring installer’s dream of ending lonely Christmases has grown into central Maine’s biggest holiday event, with as many as 1,000 people expected to come to the 7th annual Central Maine Family Christmas Dinner on Wednesday. 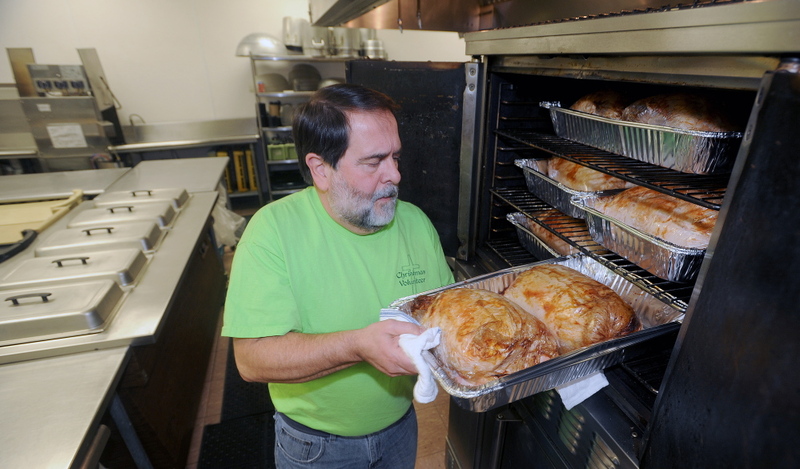 Norman Lawrence, 62, better known by the nickname Ziggy, is quick to deflect credit for the event to the hundreds of volunteers who come together to organize the free turkey supper, meant to make sure that no one had to be alone during the holidays. But it’s hard to imagine that any of the volunteers are putting in as much time and effort as Ziggy himself. On Sunday, speaking on the phone from his Albion home, his wife Kim Lawrence occasionally chiming in with a key detail in the background, he ticked down a list of obligations written down in his appointment for Monday. He was scheduled to pick up hundreds of T-shirts, sit for a television interview, pick up two cases of ground coffee from one donor, borrow a set of walkie-talkie radios for key volunteers to use, and then visit the Waterville Elks Banquet Facility, where the event will be held from 11 a.m. to 2 p.m.
As the dinner draws near, every day of his appointment book winds up like this, he said, full of small tasks that are needed to make things run more smoothly. “More than anything, I’ve learned, I always worry about little things, but I’ve learned that the Lord takes care of what needs taking care of,” he said. Lawrence said the jobs he gets laying carpet, tile and linoleum slow down this time of year anyway, so he’s happy to put his day job aside for a while. “I have a couple jobs, but the customers know I can’t get to it until after Christmas,” he said. The payoff for Lawrence and more than 200 volunteers will come on Christmas Day. Last year, as has been the case for the past couple of years, about 850 people showed up to eat a full Christmas dinner, listen to caroling, and take advantage of free horse-drawn wagon rides. Lawrence and his team have been prepared to feed 1,000 for the last couple of years. This time, he believes 1,000 people might actually show up because, he said, local food pantries have reported an increase in usage. “We don’t want to run out,” Richard Dionne, who heads up the kitchen before and during the holiday, said. On Monday and Tuesday, Dionne and his crew came in to cook and prepare about 400 pounds of turkey, eight gallons of cranberry sauce, 350 pounds of mashed potatoes, 350 pounds of squash, 1,000 dinner rolls, 150 pounds of peas, 100 pounds of stuffing, 10 gallons of fruit punch, 24 gallons of milk, and tables full of donated desserts — in all, nearly two tons of food. When Dionne finds a quiet moment and slips out of the kitchen to watch the long tables full of people eating his food, he said he’s proud of the comments he overhears. Lawrence said the event’s challenges and costs have both grown from its first year, when about 300 people attended. If it continues to grow, he said, seating will become a problem. Right now, the banquet hall seats 350 at a time, but not everyone arrives at the same time, which allows them to handle the larger numbers. Lawrence said there will be music, including organized carolers, and Santa Claus will be on hand to distribute present-filled stockings to children. A small fleet of vans will be on hand to drive people to and from the event. Lawrence said those who need a ride, or who would like more information about the event, can call 314-5981. In all, discounting the items and time donated to the cause, the dinner costs an estimated $8,000. Lawrence said food prices have increased, bringing the per-plate cost from $2.52 last year to $3 this year. Other major expenses include advertising, T-shirts, and liability insurance. The increased prominence of the event has led to more corporate donors, which has allowed him to keep pace with the growing costs. This year, he said, there are 21 sponsoring entities, including service organizations like the Waterville Elks Club, the Fairfield VFW and the Albion Lions Club; area pharmacies in Fairfield, Unity, Oakland and Winslow; small businesses like Prime Financial, Fisher Financial and Kennebec Eye Care, all of Waterville; and other area businesses, like Plum Creek Timber in Fairfield, Assistance Plus in Benton, and three State Farm Insurance officers in Waterville and Winslow. Organizations sponsoring the event for the first time include Kris-Way Truck Leasing, Ray Haskell Ford in Oakland, Oakhurst Dairy, Zimba in Fairfield, Fairpoint Communications, and Poultry Products of Maine in Winslow. But for those who attend, the dinner is free. Lawrence said that, while the organization accepts money at other times of year, it won’t take any donations on Christmas Day. Lawrence said he first came up with the idea of a community Christmas dinner because he didn’t want people to have to be alone on the holiday. Holidays are a joyous time, he said, but they can also be a time of increased depression.